Prairie Meadows recently awarded Easter Seals Iowa a Community Betterment Grant totaling $50,000. The grant will help fund the Lodge renovation at Camp Sunnyside and provide campships. Prairie Meadows is a nonprofit business dedicated to lessening the burden of government by promoting economic development, jobs, agriculture, and tourism in the state of Iowa. The Community Betterment grant will improve the lives of people in Central Iowa and throughout the state by enabling Easter Seals Iowa to complete the Lodge at Camp Sunnyside. The Lodge is the hub of activity at camp—where meals are served and campers gather for fun, games and social interaction. 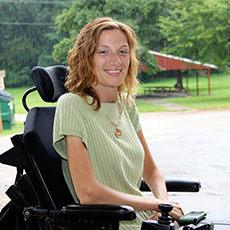 The Lodge is in need of renovations to make it accessible and to provide a climate-controlled environment for the year-round services provided at Easter Seals Iowa. The grant also provides campships to families and campers who otherwise may not be able to undertake the cost of sending their loved one to Camp Sunnyside. While at Camp Sunnyside, campers gain independence and confidence as they try new activities and meet new friends, allowing them to effectively engage in the community with enhanced social skills and confidence in their abilities. “At Prairie Meadows, we are dedicated to transforming the lives of those living in Central Iowa. We are proud and excited to support this and many other projects in our community,” said Julie Stewart, Prairie Meadows’ Director of Community Relations. Visit www.prairiemeadows.com/community and www.eastersealsia.org to learn more about these organizations and the causes they support. Prairie Meadows began operations as a nonprofit organization in 1989, with the goal of promoting economic development, jobs, agriculture, and tourism in the state of Iowa. Through taxes, grants, and charitable donations, Prairie Meadows has given more than $1.7 billion to the state of Iowa. Prairie Meadows offers more than 1,700 slot machines, table games, live and simulcast racing, hotel accommodations, entertainment, and more.